Hemlock belongs to the family Umbelliferae of genus Cicuta, and is a biennial herb that grows erect to an average height of 1 to 3 metres . · Hemlock belongs to the family Umbelliferae of genus Cicuta, and is a biennial herb that grows erect to an average height of 1 to 3 metres (Fig 21.6). · The larger stems are hollow and bear numerous purple spots that are very distinctive. · Leaves are fine, light-green, and fern-like. When crushed, they give off an unpleasant “mousy” smell. · Fruits are smooth skinned with crenate ribs, and are binocu-lated, measuring about 9 mm long, and 6 mm across. The toxins of poison hemlock are simple piperidine alkaloids: coniine and gamma-coniceine. They are structurally similar to nicotine and possess similar clinical features in toxicity. The mode of action is two-fold. The most serious effect occurs at the neuromuscular junction where these alkaloids act as non-depolarising blockers causing respiratory failure due to flaccid paralysis. The second effect at the auto-nomic ganglia is nicotinic in nature resulting in salivation, mydriasis, and tachycardia, followed by bradycardia. Less commonly, rhabdomyolysis and acute tubular necrosis can occur. · Nausea, vomiting, abdominal pain. · Stimulant phase: tachycardia, tremors, sweating, mydriasis,convulsions. · Depressive phase: bradycardia, ascending motor paralysis,and coma. · Aggressive GI decontamination: lavage and activated charcoal. · Forced diuresis may help in preventing renal failure. 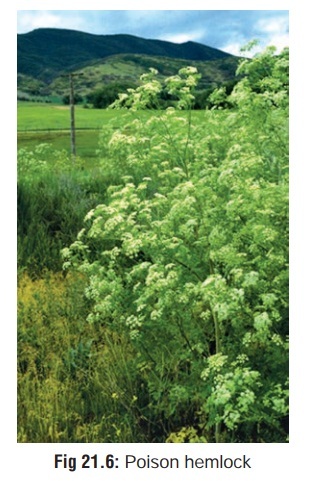 · Hemlock was popular in ancient times as a means of execu-tion. The most famous personality executed in this fashion was Socrates, who was condemned to death for his “crime” of introducing new divinities. · Today, most cases of hemlock poisoning result from accidental circumstances due to mistaken identity with edible vegetables such as wild carrot, parsley, or anise seeds.